It’s been a whole 7 months since our last big Zoho CRM launch. We have been working hard so our customers can sell smarter, better and faster. We just couldn’t wait another day to reveal the latest and greatest we’ve been working on. Are you ready? Zia lets you know when something is going extraordinarily well –or wrong- in your sales operation. Any human can know by the 20th of the month whether you are likely to make quota or not. It takes super-human intelligence to be able to detect –early on- when something upstream is not going the way it should. Whether you are getting fewer leads than you should for this time of the year, reps are making fewer calls, or you are converting fewer deals than usual, whatever it is… Zia is constantly on the look out for you – 24/7/365. When she detects an anomaly she lets you know so you can take prompt action before it’s too late. 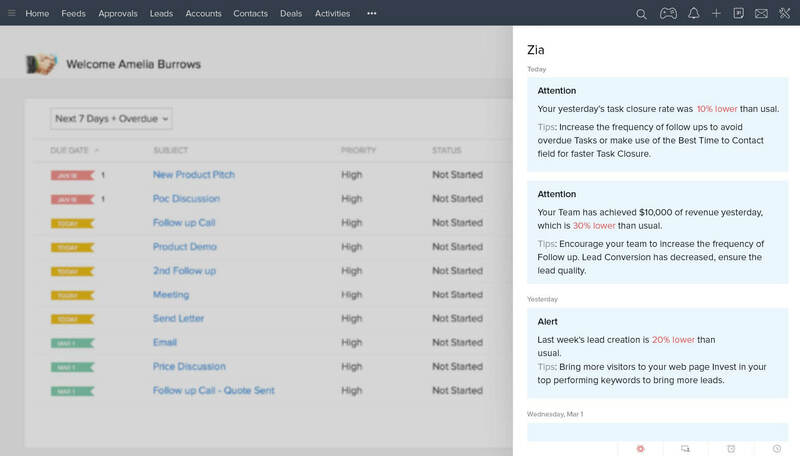 Zia helps bring the end of voicemails and unread emails. In sales, timing is everything. 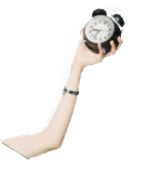 What is the best time to contact a particular prospect? Well… it depends on that particular person. This is why Zia is so helpful. For any customer or prospect in your pending activities, Zia will let you know her predictions about what times of the day this person is most likely to pick-up the phone or open the email. Zia knows what you want to do – and helps you do it faster. Zia is capable of learning, over time, the most frequent actions a particular user takes on Zoho CRM. Some of these actions are one-offs, they happen so infrequently that it’s ok to do them manually. Some of them happen so frequently that the CRM admin has already automated them. But then there’s the big collection of actions that happen only “a few” times a week. 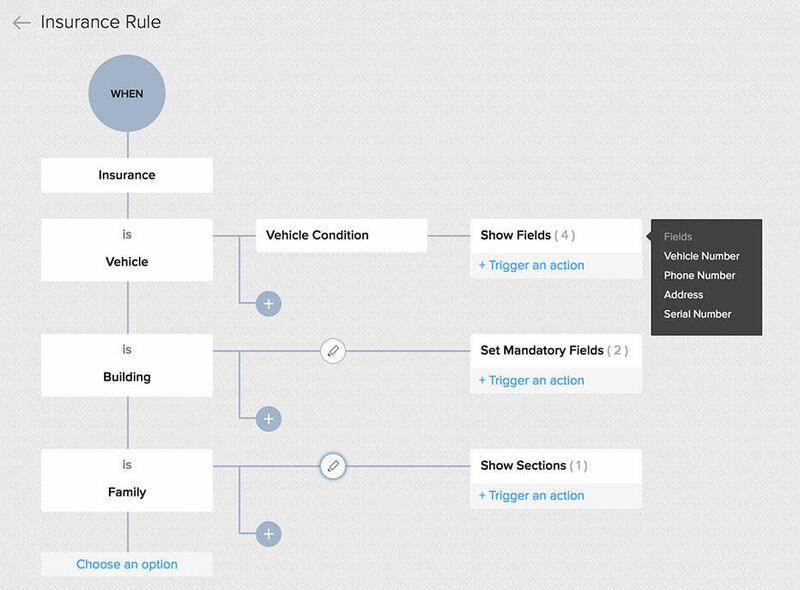 Users might not think of automating these actions, or might not even know how to… but Zia knows how. A typical example of this, is to open a record, call a customer, change the status and then set a follow-up task. When Zia watches you perform a particular set of actions repeatedly, she will not only suggest automating them with a workflow or macro, but she will also go ahead and set up the automation for you. If that wasn’t smart enough, how about this: Zia is already included in your Enterprise plan. No need to pay extra for it. Even Einstein would agree that’s the smart thing to do. 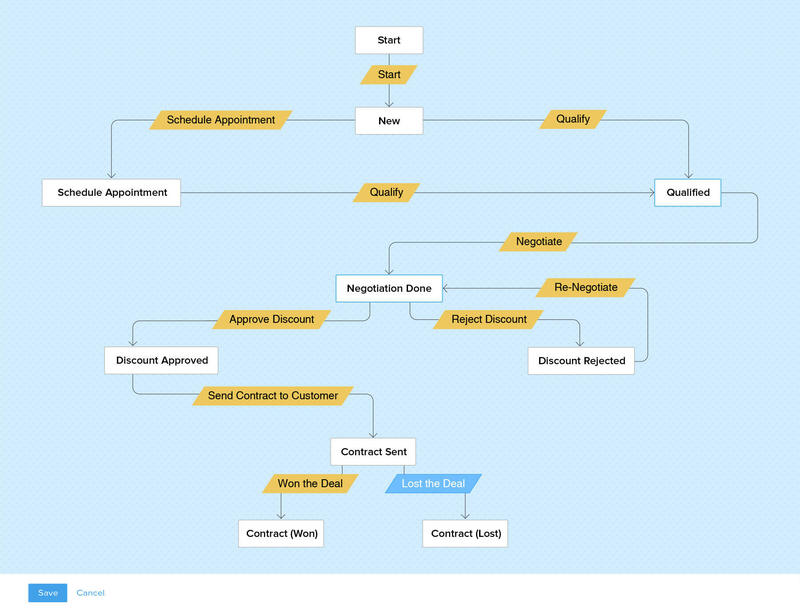 Creating diagrams of how your sales process should work is nothing new. This is the way most sales managers visualize their process and train people with. What has always been difficult is to take that diagram and put it into practice in your daily business operations. That has been the difficult part – until now. 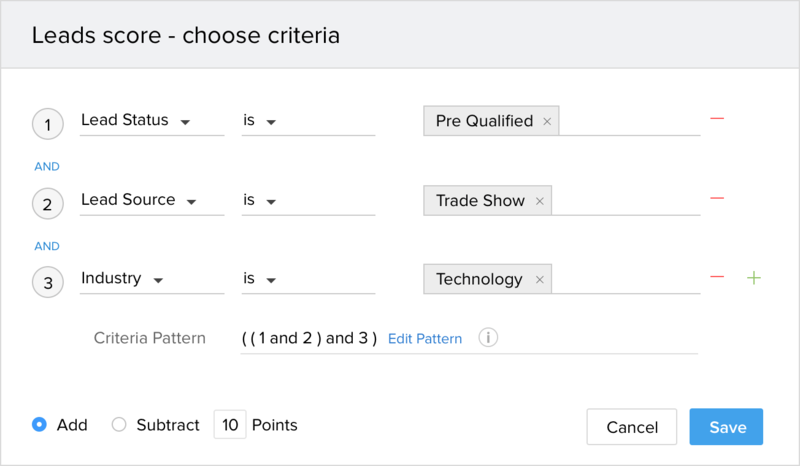 Blueprints in Zoho CRM offer an easy way to design –and implement- a sales process and have everyone execute it as it was designed. This also cuts down on training costs and confusion of new team members, and gets them up to speed –and selling- faster. The visual Blueprint editor allows sales managers and CRM admins to quickly draw up their process and map steps in a process to a field status in their CRM. In addition, they can specify what are some of the conditions that must be met before a lead or deal makes it to the next stage, and, also what additional information is required. 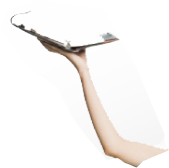 New telephony carrier integrations and the PhoneBridge platform. Zoho CRM has 14 new fully-integrated cloud PBX and cal management solution vendors, including Jive, AT&T Office@Hand, Aircall, Vonage and many others. In addition, we’re making it easier for other telephony vendors to integrate with Zoho CRM. We’ve turned PhoneBridge, previously a closed feature of Zoho CRM, into an open platform that helps telephony vendors to integrate with our apps. Push Zoho CRM information to Slack. 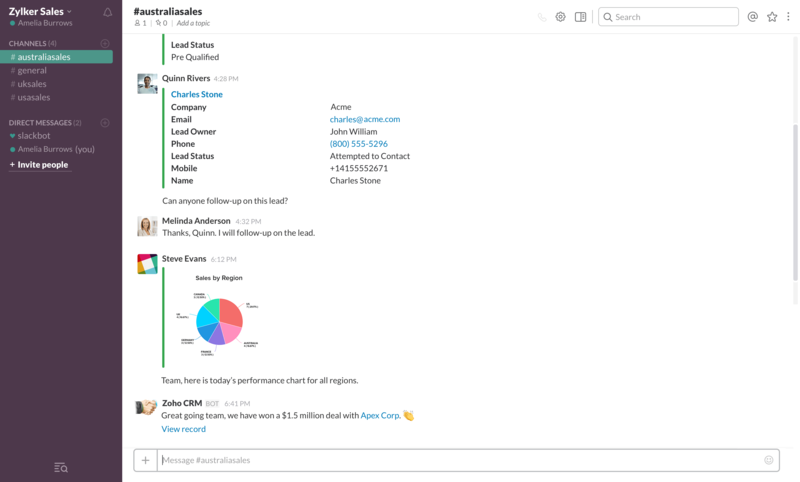 You can now share records or dashboard from Zoho CRM with your channels in Slack. Notify your team instantly about updates like deal win and get reminders in Slack about your Zoho CRM calendar activities. Office 365 integration. 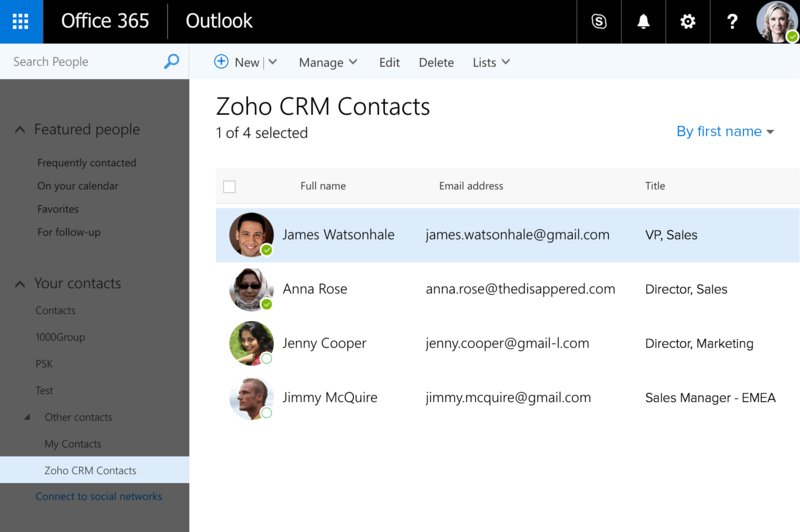 Similar to our Google Apps integration, Office 365 customers can now have all their users contacts and calendars in one place. Simplify data entry with conditional fields. You can now display only the relevant fields a user needs to fill out in a particular Zoho CRM form, resulting in a faster and clutter-free experience. Lead Scoring: Prioritize leads with positive and negative scoring, ensuring your sales reps focus on the right leads – and convert them faster. We are confident today’s updates will help our customers sell smarter with Zia, sell better with Blueprints and faster with SalesSignals. Are you as excited as we are? Let us know in Twitter or Facebook using the hashtag #sellsmart.